I picked up The Impossible Exile because I wanted to know more about Stefan Zweig, who, to me, was only the author of a bunch of historical biographies, including one about Marie Antoinette. I thought the book would be a regular biography of this Austrian Jewish writer. But I was wrong. The Impossible Exile is much more than that. Prochnik uses Zweig's story to discuss exile, the difficulty in adapting to an isolated life in a foreign country, away from everything you know and love, and the loss of identity that results from it. It also depicts the political situation in Europe from the '20s to the mid '40s, the rise of Fascist and Nazi regimes, the path of self-destruction Europe had chosen, and the way European culture was so different from the American one. One of the most famous writers of his time, and still widely read and translated today, Zweig was an intellectual, a lover of the arts, a pacifist, and a self-proclaimed "keeper of European culture" who, with his writing, tried to promote international humanism. He also loved Vienna, who had been, in the years before the Anschluss, tolerant towards Jews. But when the Nazis took over the city, they destroyed its culture and the world Zweig knew. He soon decided to go into exile, first to England, then the US, and finally in Brazil, but he wasn't able to create a new life for himself in any of these countries. Unable to feel at home anywhere, he finally committed suicide. The Impossible Exile is a compelling, but slightly confusing, book. That's because Prochnik doesn't follow a chronological order. Each chapter, rather than simply dealing with a few years in Zweig's life, focuses on a specific theme related to exile, like the loss of personal identity, the relationship between literature and politics, the culture of the coffeehouse which was such an important part of European life totally missing in America, and lots more. This is also the reason why personal information is kept to a minimum. Friderike and Lotte, Zweig's wives, his niece-in-law Eva, his mother and friends are all mentioned in the book, and anecdotes abound, but only when relevant to the exile theme. The book is beautifully written. Prochnik, whose family too had to flee Europe to escape from the Nazis, helps us understand the tragedy of exile in a clear and poignant way. His book is both fascinating and compelling. Once started, you won't be able to put it down. If you're interested in Stefan Zweig and the plight of refugees who had to flee from Nazism, you should definitely pick up a copy. You won't regret it. 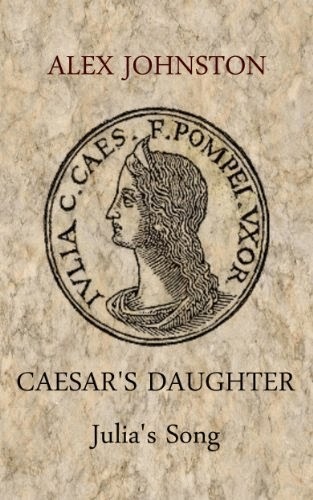 Caesar's Daughter is a bit different from Johnston's two previous novellas. His previous work is more action-packed, while this one more political. With that, I by no means mean boring. In fact, Johnston is one of the funniest historical fiction authors I know. What I mean is that, in Caesar's Daughter, we can watch the machinations of the political players of the late Roman republic. Pompey, Cicero, the infamous ex-Tribune of the Plebs Clodius, the deposed King of Egypt... they are all here, hatching plots and fearing for their own lives. I also loved the afterword, where the author explains what really happened and what he made up. Fast and entertaining, Caesar's Daughter is a great way to spend a summer afternoon. Most self-help books focus on a specific area to help you improve one aspect of your life. They can teach how to better manage your time, or reduce stress, or eat a healthier diet, or manage your money. 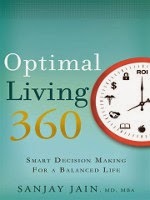 Optimal Living by Sanjay K. Jain, instead, covers all these topics and more. We tend to think of financial, spiritual, intellectual, and health issues as separate and distinct, but they are actually closely intertwined and, to live the most-fulfilling life you can, you need to take care of all of them. Dr Jain helps you to do just that. How? By teaching you how to make decisions to receive the highest return on investment in life. Dr Jain looks at the big picture to figure out how every decision we make affects our quality of life, both in the short and long term. Too often we chose to do what's easy, forgetting that, overtime, those choices leave us unhappy and distance us from our goals. By looking at the big picture, we can instead make the right choices that will allow us to live the life we truly want. None of the tips shared here are particularly groundbreaking. In fact, you've probably heard most of this stuff on TV, or maybe read about it in a magazine or another self-help book. But the strength of this book is that, here, all these bits of information are packed together, allowing us to see how they intertwine and that all of them are important to live a healthy and fulfilling life. This also makes the book a great reference guide. Once you've figured out what aspects of your life you still need to work on, you can go straight to those sections and implement all the tips outlined there. Dr Jain often shares personal stories, which allows the reader to relate and connect to the author and the important message he's communicating. He writes in a clear and straightforward manner, without preaching, so that the book flows easily. Informative and inspiring, this comprehensive self-help guide is well-worth a read. Would you like to ready any of these books? Disclaimer: I received these books in exchange for my honest opinion. In addition, this post contains affiliate links.